Don't let your favorite healthy foods give you an unsightly gut. Here's what to look for. Physique Builders: Anyway you slice it, beef has a nutritional arsenal to give you more muscles than a clambake. “Steak is an excellent source of protein, iron, zinc, vitamin B6 and vitamin B12 – all bodybuilding musts,” Gidus explains. Physique Killers: Not all cuts are created equal, though. Some, like the infamous rib eye and prime rib, can have more fat than a plastic surgeons waste bin. Sure they taste awesome, but think with your midriff and not your palate. 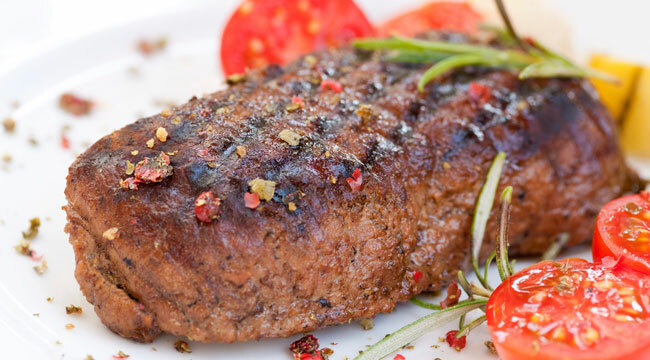 Wise Play: Gidus, who encourages red meat consumption, recommends opting for leaner cuts such as those labeled “round” or “loin.” A cut of top sirloin may weigh in at 50 less fat grams than prime. “You can also trim visible fat,” she adds. But don’t do this until after cooking, so as to maintain moisture.